I was watching a video on YouTube the other day and I saw Jennifer McGuire making some cute tags. I don't have the die that she used so I just cut a few sheets of white stitched rounded rectangles using my Cameo. Then I cut some tags using blue, green and red card stock. I had just purchased a new stamp and die set from Lawn Fawn and I knew right away it would make super cute tag accents. 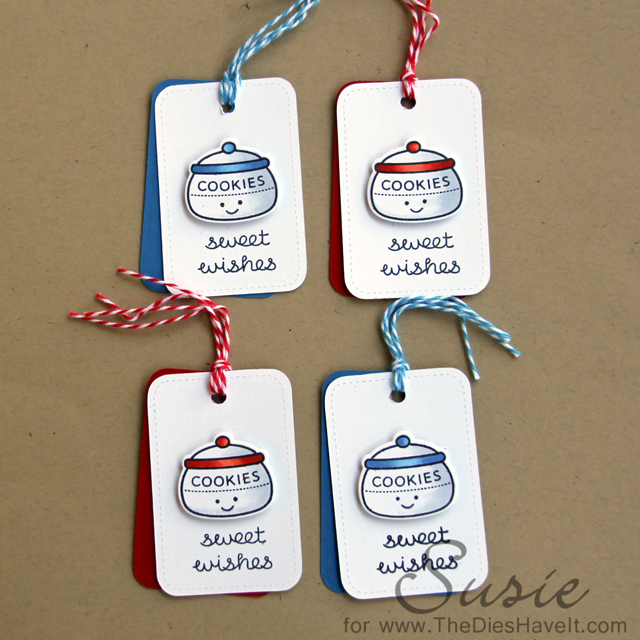 I stamped the cookie jar onto four tags. I used a medium grey marker to color in each jar in its entirety. I also stamped the sentiment onto each tag. Then I stamped and die cut four more cookie jars. You can see how I colored each above. It was an easy coloring job - a little red, blue and grey. I popped up each cookie jar using a pop dot. The grey colored jar below provides a lovely shadow. I punched a hole in each set of two tags and tied them with baker's twine.